Despite my best intentions I do seem to let a lot of the things that I grab to write about stack up. While that may not seem like the worst thing in the world (Oh noes! I seem to have a pile of boozes on a shelf and I HAVE to taste them all…) it does make me feel like a naughty schoolboy who hasn’t done his homework. So, when a mail arrives from the Whisky Tasting Club to let me know that my next box of whiskies are on their way, reminding me that I haven’t even opened my last tasting box yet, I feel the urging boot of ‘get on with it’. Rather than a gentle sampling over the space of a couple of weeks, like I did last time, I decided to sit down and make a ‘proper’ tasting. I will admit that it was in part to get use of the five watchglasses that I slightly drunkenly purchased at Whisky Live a couple of weeks back. I like glassware too much. Anyways, tasting set #2’s theme is Whiskies of the World and included drams from the USA, Japan, India, England and The Netherlands. Taking them in the order in the accompanying leaflet I started with the Zuidam 5 year old Dutch Rye. I’ve written about this one before, as I have with most of the whiskies in this box, but found it a bit less sweet than last time. On the nose my notes describe it as ‘mentholated bourbon’, with sharp rich fruit, vanilla, coconut and foam bananas – overall sweet but with an underlying tannic dryness. To taste I got sour cream, sweet vanilla caramel, hints of cinnamon, sour white grapes and a creamy woody finish. Water brought out more sourness with grapes and wood and added vanilla to the finish. Next was Nikka from the Barrel. I’m a big fan of Nikka and this blend was my choice for my own aborted Whiskies of the World tasting. It also has a really pretty bottle. On the nose there were raisins, sweet wood and flowers – very reminiscent of good aged grain whisky (one of my favourite things). To taste there was big dry wood, turning quickly bitter through plump sultanas to a dry cardboard finish with quite a lot of alcoholic prickle on the tongue. Water tamed everything and amalgamated the flavours – tannic vine fruits leading to a sour woody finish with a good chunk of booze hanging around. Third was Amrut Fusion, which I tried at Albannach a few weeks back. On the nose I got much more this time, with butter, bread and a hint of vanilla standing out over a hefty alcoholic hit – ‘boozy brioche’ my notes say. To taste it was quite closed but I got a light creaminess followed by a spike of fruit and grain. It can take a good chunk of water and the flavour opened up to reveal cream, sweet crunchy apple and hints of grain leading to a woody finish of old furniture and fruit trees. 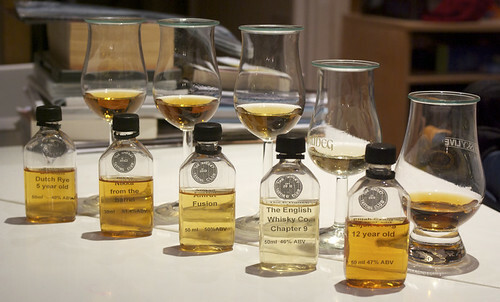 Next was the English Whisky Company Chapter 9, which I tried at the first Albannach Whisky Hub. At three years old this is as young as whisky gets and it definitely shows. On the nose there was cream backed by fruity peat, sweet lemons and a hint of green wood smoke. To taste it was quite light and oily, with a peat smoke burst surrounded by apples and lightly muddy vegetal notes. There was the taste of young whisky (the caraway/aquavit flavour of young barley spirit) and the finish was short and tasted of digestive biscuits. Water killed most of the smoke leaving sweet citrus and young spirit – a lemon aquavit? My bottle of this is staying in the cupboard unopened for now. Last was Elijah Craig 12 year old, the only one I don’t remember trying before and one I’ve been meaning to for a while. I’ve been a fan of Elijah Craig for a while ever since my last stop at my first Whisky Live was their stand – I stood there quite wobbily, talking about barrel aging of spirits in different climates with a group of similarly wobbling punters and the stand owners, having very little clue about what I was saying and occasionally having my glass topped up by people who seemed to find that amusing. I may have tried the 12 then, but that was pre-notebook and the only thing I remember from that part of the evening was my misplaced certainty that I knew everything about barrels. On the nose the 12 year old had big sour caramel, rich PX-like raisins, golden rum, coconut, glace cherries, a hint of pepper and some underlying sour grain. To taste it was thick and waxy but lighter than the nose suggested. It started with sweet grain and moved through cherry, crunchy mango and violets to a throat-warming finish of sweet fruit wood. Water smoothed out the slight throat burn and brought out some sweetness from the wood – green apples in the middle, dusty raisins at the side and the cherries become more glacé-like. My next box is sitting on my desk along with a copy of Dom Roskrow’s World’s Best Whiskies , a bonus for having for subscribed for 3 boxes, and this set’s theme is Wood. Hopefully I’ll get round to cracking these open a bit sooner. Japanese blended whisky, 51.8%. ~£25. Indian single malt whisky, 50%. ~£35. English single malt whisky, 46%. ~£40. USA bourbon whiskey, 47%. ~£25.